After I got rid of my old Brunnen Kompagnon A7 notebook last month I was looking for a new alternative. If you read the Kompagnon blog post you might remember that I had three favourites (Samsonite, Staufen and X17). More alternatives were suggested in the comments to the blog post, but the suggested notebooks were unfortunately bigger than A7 and therefore too big for my shirt pocket, so I ruled them out. In the end I decided to get the X17 and am quite happy with it so far. I picked the Mode or ModeSkin version. X17 described the Mode version as being made from bonded/regenerated leather. One of the names this material is known by in Germany is Lefa (Lederfaserstoff – leather fibre). It is a very nice material and this version of the X17 notebook is also available in A7 size for two inlay booklets. Let me explain how it works with the booklets: the paper of the X17 isn’t glued to the cover, but is instead removable. You can buy covers, made from different materials, that can hold between two and four booklets. There is also a version for one booklet to be released soon. Booklets are available plain, ruled, squared, as a calendar plus there are a few rather unusual versions, too, e.g. for pilgrims or for teachers. I ordered 2 ruled and two squared inlay booklets. The squared version did, however, surprise me. While squared paper squares in most parts of Europe1 have sides of 5 mm length the X17 has sides of 2.5 mm length. To my surprise each page has a white border, too. I definitely would have preferred “standard” squared paper, but can live with this paper. Overall I am quite happy with the X17 notebook. The reason why I got rid of my old notebook was that after a few years the plastic of the cover got old, had some tears and these tears had sharp edges which damaged my shirt pockets. The Lefa material of my new notebook feels very pocket friendly and I cannot imagine it ever developing any sharp edges if old, torn or damaged. I just mentioned that all parts can be bought individually, this means that the inlay booklets can be replaced. I use one for todo lists etc. and replace it if full, while the other booklet gets used for permanent information I would like to keep in the notebook. The pages in the booklets are perforated which makes it easy to rip them out if needed, e.g. to write information down for someone or if you want to leave a note somewhere. 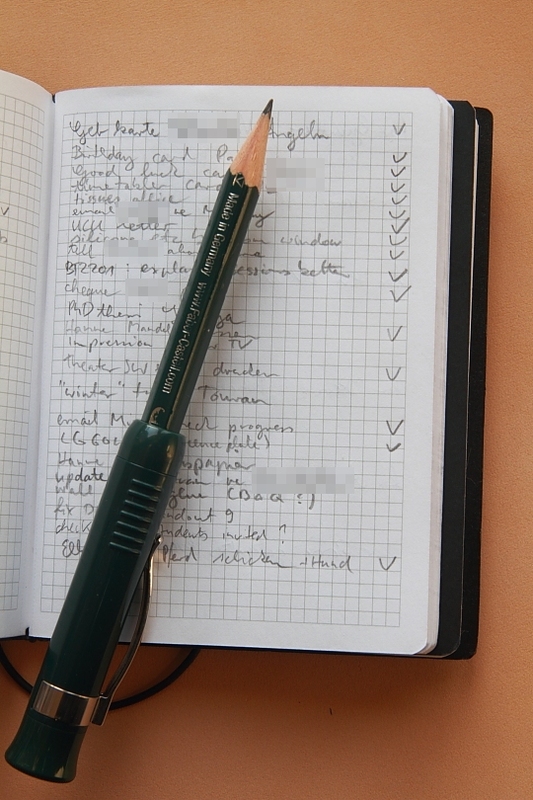 Depending on how a traditional notebook is bound, ripping a page is not a good idea. It can make other pages become loose or fall out, too. This was the case with my previous Kompagnon notebook. Unlike many other notebooks the X17 does not have a pocket in the back. This makes it difficult to store little items like receipts. In my old notebook I used the back pocket to keep bits of paper to use as notes. Since I can remove the perforated pages now I do not really have a need for the pocket any more, but it would be nice, just in case. 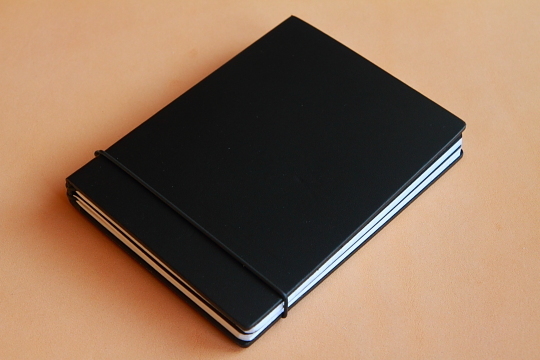 The way the rubber band (called elastiX) works means that the notebook is not closed as firmly as a moleskin-type notebook. In my shirt pocket the end of the Faber-Castell Perfect Pencil sometimes ends up in the notebook, bending the pages slightly. Because I bought the components for my X17 individually, not as a set, I had to assemble everything myself. This is not a problem in itself, but there were no instructions how to knot the elastiX rubber bands together. I could not find any instructions on the web site, either. I also didn’t realise the X17 comes without a ribbon bookmark – it needs to be ordered separately (I could have probably found out by spending more time on the X17 web site). Including shipping I paid €24.50 (~ $33.70; £21) for the two booklet version of the X17, this price includes the elastiX rubber bands, and four booklets. Not cheap, but not too expensive either, keeping in mind that the X17 feels very well made. I am sure I will be able to use it for many years to come, hopefully longer than than the Brunnen Kompagnon. Looks really nice, Memm. I’ll be interested to hear how, over time, this notebook holds up for you. Thanks for your comment. I’ll let you now in a few months (or years) how it held up. How do you make the not in the elastic rubber band? The X17 is still going strong. The shape might have changed a tiny bit, but the surface is still like new. I am quite confident it will last many more years. Once, a rubber band tore, but I got a free replacement. Katherine, I was a bit disappointed that I couldn’t find any instructions, so I had a go and luckily it worked out, but I cannot remember how I did it. I somehow made a loop and then put the second band through that loop.